High Water Trips on the Middle Fork and River of No Return? Idaho is known for its World-Class Whitewater… June earns that reputation. What is June like on the Middle Fork? A common question these days. 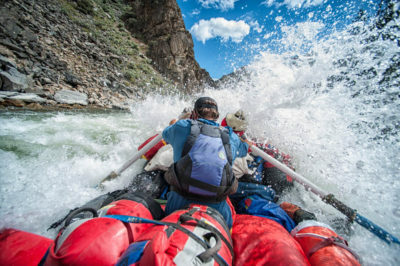 The Middle Fork is known for legendary whitewater, and June is responsible for that reputation. High water on the Middle Fork is an awesome experience. Fun, fast and continuous whitewater combined with mind-bending wild flowers, electric green foliage, and the canyon’s waterfalls (side canyons) in full glory. But this time of year also demands respect, a different perspective than our July & August raft trips. Rocky runs June trips like a team expedition. Safety is always first. We will watch river access, water levels and weather closely making decisions based current conditions. Like any expedition, as the trip approaches we will updates guests on equipment and logistic details. The sweet-spot. Perfect water levels collide with summer temps earlier on the RONR than the higher elevation Middle Fork. If you ask the guides when is the best time on the RONR, they will unanimously agree…late June. The RONR starts at 3,000 ft in elevation , ending at 2,000 ft providing warmer air temps and water temps . The Salmon River canyon is huge , accommodating the runoff like it was built for it. June trips offer huge, fast and fun rolling waves…think 85 mile long roller coaster. The river is running fast, allowing us to fully explore the River of No Return’s rich history. Learn about Lewis & Clark, homesteads, hermits, Indians, all while immersing yourself in the Gold Rush era history of the canyon. Summer is on the horizon and trips are filling fast!